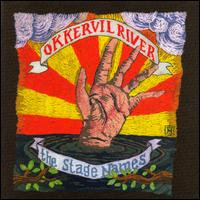 Okkervil River's newest album, The Stage Names, came out Tuesday on Jagjaguwar records. I have always enjoyed their records and they even have a few songs I would consider great ("Black", "A Stone"). The Stage Names however might be their first great album and easily one of the best albums of the year so far. Will Sheff's voice can convey more emotion in one song than most singers can muster for a whole album. The lyrics are still dark and the music is still all over the place at times but they have reached some level of contained chaos on this record and it works perfectly. This is one album I really would recommend to almost anyone and I'm sure it will find it's way up pretty high on my albums of the year. By the way, you can stream the entire album here on their Myspace page. Enjoy! !